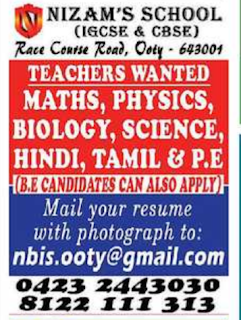 Nizam's School(IGCSE,CBSE),Ooty has advertised in THE HINDU newspaper for recruitment of Teachers jobs vacancies. 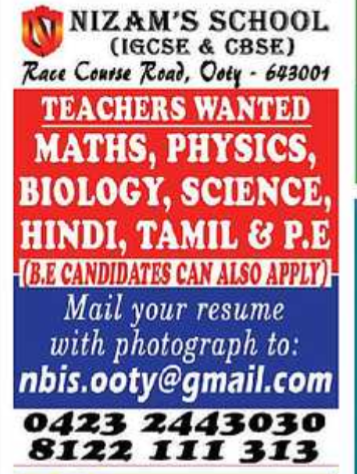 Interested and eligible job aspirants are requested to apply immediately. Check out further more details below. 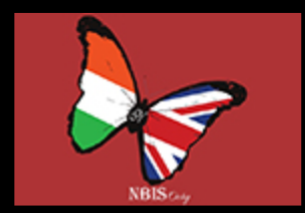 About School: NBIS is located in a lush green locality at the Queen of Hills, Ooty, The Nilgiris. Situated on a hill, NBIS has a clear view down its valley that runs right into the heart of the capital town Ooty. The school campus is a vast stretch that can host classes from K-12 with all the necessary amenities required of a good institution. The students' hostel and the staff quarters are situated well within the compact campus. The safety of all is well taken care of by an able security team and system.The ambience is rather enviable and is one of pride to all associated with NBIS.The play grounds, like its class rooms, labs, library, dining hall, the office and all others associated with the school, are well designed and equipped. BE candidates can also apply.